Studying 100-Baggers is important because most were microcaps when they started their ascent. We’ve actually had ten 100-Baggers that made this incredible journey in just five years. In 1972, Thomas Phelps wrote “100 to 1 in the Stock Market”. Phelps studied the 365 stocks that returned 100 to 1 (aka 100-Baggers) between 1932 and 1971. You can find some great nuggets of wisdom in his book. Chris Mayer picks up where Phelps left off analyzing all 100-Bagger stocks from 1962-2014. Chris Mayer’s “100-Baggers: Stocks That Return 100-To-1 And How To Find Them” is a very easy (<200 pages) and enjoyable read (c’mon how can’t you enjoy reading about 100-Baggers?). It’s great to read about 100-Baggers, but we want to find them early. Chris does a great job outlining the attributes of great businesses, from high ROE to owner-operator intelligent fanatics. Mayer and his analysts offer 100-Bagger case studies on Monster Beverage (700-Bagger), Amazon (146-Bagger), Electronic Arts (104-Bagger), Comcast (200-Bagger), and others. In the book, Mayer also mentions investor and MicroCapClub member Chip Maloney’s case study: MTY Food Group – A Case Study of a 100-Bagger. Finding great companies early is only half the battle. We then have to learn how to hold them. The book packs a punch of wisdom by providing modern day analysis and discussion on “buying right and sitting tight”. Most investors crave action instead of lethargy and sloth. I highly recommend investors read this book. You can also meet author Chris Mayer at our MicroCap Leadership Summit 2016. I think one of the biggest assets of this book is the list of 100-Bagger stocks in the back. I love reading about the intelligent fanatics that started these businesses. If you want a fun exercise, go through the list of 100-Bagger stocks, Google their founders, and read articles-books that have been written on them. Let me give you an example how fun this is. Polaris Industries (PII) went public in 1988, took 22.5 years to be a 100-Bagger, on its way to being a 500-Bagger today. Polaris was founded by Edgar Hetteen. What is also interesting is Edgar later founded a competitor Arctic Cat (ACAT), another public snowmobile/ATV company. 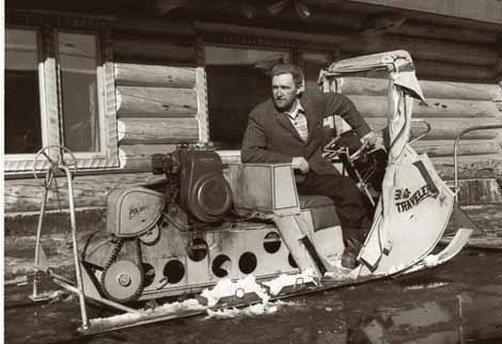 Edgar has been long considered the father of the snowmobile industry. Here is the quick story from Edgar Hetteen’s obituary. By 1954, Johnson and Allan Hetteen (Edgar’s brothers) had cobbled together their first prototype of a snowmobile, using a 10-horse Briggs and Stratton engine from the local hardware store mounted in back, a track made from a steel binder chain — “the kind used on manure spreaders,” Johnson said — and a seat of steel in the middle of a “tunnel” of sheet metal. “The first one only went 10 mph,” Johnson said. Edgar was a skeptic, figuring it would never work or never sell. Sales rose in the late 1950s, but the board of directors of Hetteen Hoist and Derrick kept pressuring him to nix the unknown new snowmobile product for the steadier farm implement business, which they had done for a decade or more. Edgar Hetteen decided to show everyone: in a long-celebrated long journey in 1960, he and three others took the Sno-Travelers on a 1,200-mile trek in Alaska, from Bethel to Fairbanks, in three weeks. It proved snowmobiles were reliable enough to replace dog sleds, Johnson said. That appears easy on the surface, but isn’t. That I do know. Yes, it is very hard to stomach the ups and downs, and basing your investment decision on business performance not necessarily stock performance. This type of investing is the most business like. You are essentially partnering with the CEO/management team, but with the fluctuations in price, I agree the holding is the most difficult part. Chris’ book was a good read. I can’t find the part in the book but I remember it said that some of these stocks lost 50-80% of their value MULTIPLE TIMES on their road to 100-baggers. The chart about Monster’s stock monthly moves going + – 10-20-30% shows how hard it can be to hold on. Ian, I bought the book, and the other it mentions extensively by Phelps, “100 to 1 in the Stock Market: A Distinguished Security Analyst Tells How to Make More of Your Investment Opportunities” and am enjoying them both. And learning a lot. In my twenties I had a mentor and investment client, Pat Sheridan, who I think I’ve mentioned earlier. He owns mines all over the world, including one he sold a few years ago for $10 million. But anyway, he told me he had a mentor when he was in his twenties who bought stock and never sold them. That didn’t make sense to me for two reasons. First, I thought I could outsmart the market, and do better than a coffee can portfolio. After reading the early chapters of these books, I’m definitely wanting to look at that predisposition more carefully. When I think of where stocks have gone after I sold them, and how quickly 30 years has passed in my life, I think my basic investment selling criteria needs to be reviewed. The other question on my mind is — so you die worth $15 million in stocks you’ve never sold — in fact lived as as you never owned them. And the purpose? I guess to pass on to your heirs, however worthy or unworthy. I’ve got wonderful sons, fine young men, but would $5 million each make their lives better? Probably not. It would definitely make their path riskier. Anyway, really interesting books and unlike anything else I’ve read and appreciate you bringing them to my attention. I think most people can’t hold stocks because they are focused too much on their short-term desires. I want a new Mercedes or that new House. They view investing as a means to produce income instead of wealth. I think what Phelps, Mayer, and what I’ve learned to is you can make more, much more, by just having a slightly longer time horizon with your investments. Most people will sell something because it’s up 50% in a year instead of having the foresight to see that it could be up 500% in five more years. The 50% produces income, the 500% will produce wealth. A common mistake is when people view “holding forever” as buy and forget. I can only speak to microcap investing where the businesses are smaller and more volatile. This might be going slightly off topic but….“The Most Important Thing” is to know your positions better than most so you can develop the conviction to hold them and also so you know when to sell before the masses. You really want to hold as long as management executes. This can be two weeks or 10+ years. I would say that over 50%+ of microcap “success stories” are fad stocks. Companies with 1-2 products that take off for 3-4-5 years, the stocks go up 10-20x, and then soon after start their decline again. It’s much harder to find microcap stocks that have long-term sustainable businesses. With microcaps you can’t afford to buy and forget. You must buy right but always have what Jim Collins (author Good to Great) calls a constant state of productive paranoia…continuing to do maintenance due diligence. To your last point. I think it’s important to live life, enjoy life, and that means spending a bit more on what/who you love or being able to enjoy giving to people/organizations that make an impact. Giving money away should be viewed just like investing. Where can I give where its impact will be multiplied. I often times need to remind myself of this but…the richest person in the world isn’t the person with the most money but the person that spent the most time with the ones they loved. I think that all of this is in the context of other factors, which you have explored in your other essays/postings. With 100% of the return of the market resulting from 25% of the stocks, and the other 75% either breaking even or losing money, buy and hold works only if you buy the right securities. If you buy and hold the wrong securities, you’ve got a problem, especially if you are a full time investor. Owning the wrong stocks long term would make you a full time, short term investor. And there is always a tendency to explore these discussions in black and white terms. ie “The only way to make money in the market is . . . . xyz.” It becomes like born-again religion — damn the infidels, etc. If you don’t think like me, you are wrong. Well the facts say otherwise. There are extremely successful short term traders — Soros, and all of the people profiled in the Market Wizards series. Some have made over $100 million short term trading — not Warren Buffett but not total lightweight zeros either. An investor’s strategy has to fit his or her personality. Some need constant action. And some, in particular the Yankee tightwad personality, is best suited to buy and hold assuming the tightwad is also a good analyst. Black and white, clear cut facts like “buy high, rising dividend companies and never sell” if it were true, would make investing a lot easier. But it is a very difficult, very demanding enterprise. We’ve met the enemy and he is us. That’s my problem, anyway. As far as spending lots of time with loved ones, my Dad ran CSIS, Canada’s anti-espionage, anti-terrorist agency, and while he and I loved each other, spending more than a weekend together would have us both climbing the walls. And I think a similar scenario has evolved with my sons. They think I’m boring after a couple of days on a canoe trip, and want to hang out with their lady friends. That’s the sad reality of life and investing according to Rod. This book takes the perspective of the extremely long term investor focused on finding compounding machines in the public markets. It is geared towards the investor who spends the bulk of the investment time on the diligence process rather than trading and who is focused on buy and hold to an extreme (10+ years). The investor who benefits from this book is a rarity in today’s hyper short term focused “investor” aka speculator. This book is worth its weight in gold if one can effectively implement the concepts described here. Although it is conceptually simple, the ideas in this book are more powerful than the other investment concepts in the market today. I agree Mihir. I think successful investing is conceptually simple. The hard part is separating our emotions-human nature from investment decisions, and judging company performance by business performance and not necessarily stock performance. I suggest reading ”The Life You Can Save: How to Do Your Part to End World Poverty” by Peter Singer. Thanks SimB for the book recommendation. I was wondering if you investment style has changed since founding microcap club. Maybe you can write a piece on that. Would you say you’re becoming more and more long term? I remember reading a very old piece by you ( or I think it’s by you) where you said you were buying stocks of biotech company before they announce FDA decision and sell before that. I’m sure you don’t do that anymore. I’d be interested in that too Ian. Biotechs seem an area of the market where specialized knowledge of science and the approval process gives an investor a huge edge, and therefore not suitable for most investors, like myself, other than in mature companies with established markets. Again a thank you for reviewing 100 Baggers. I’ve found the book very helpful to the process I’ve recently undertaken to review my positions over the last couple of years, and compare those that have made money, to those that have lost. I’m considering adopting the principle of looking at my positions every month, and forcing myself to either add to, or reduce, both my best winner and worst performer. In other words if I have five positions, and one has done particularly well, I force myself to either sell it or add to it — but not leave it as is. Similarly, my worst-performing position — I must either add to it, or sell it. But the thought that bounces around in my head the most from this book is the necessity of adopting investment principles that allow an investor to make decisions independent of short term market action. That is, develop a confidence level based on non-emotional facts — for instance based on the quality of the businesses underlying the securities, independent of short term market moves. There is so much random noise in the markets — price moves, often very significant price moves, that don’t mean anything. and are in any event not predictable — so an investor needs a strategy that allows him or her to not react, one that transcends emotion. One approach is to never sell. That works, but seems crude, a blunt instrument. Another, Buffett’s, focus on company results and ignore the market, except when the market provides unusual opportunity — reasonably priced exceptional companies. But an example I particularly like is Joel Greenblatt, whose investment record you brought to our attention in a graph, and whose strategy now, based on what I’ve been able to piece together, is to go long three hundred companies undervalued based on free cash flow — undervalued because their one to two year prospects are widely regarded as poor — mostly low debt companies with free cash flow that have performed poorly in the last year — and go short the opposite — three hundred companies whose short term prospects are highly regarded but that are overvalued on a current cash flow basis, and that have lots of debt. And wait two years. In that way, he attempts to use the market’s short term bias, the desire of institutional money managers for short term performance, to achieve superior long term performance. Not only has Greenblatt adopted a strategy that insulates him from emotional short term market moves, but one that capitalizes on their irrationality, on average. Hi Rod. So while I probably don’t have as much experience as you do in investing, don’t you think re balancing your portfolio once every month is too much? Maybe once per quarter is more reasonable. I mean some companies can outperform for no other reason than due to random price fluctuation. I’m thinking the idea over for two reasons, but once per quarter may be a better idea. The objective — to end up with more money in fewer positions — positions I particularly believe in. The underlying assumption — the best positions to build may be the best performers or the worst performers. The best because a rising price suggests that others agree with my analysis. The worst because they are cheaper, and if they are good companies with leading market positions, the cheaper the better. If I can only exit positions once a month (or quarter) I am less likely to act impulsively, which in my case generally means out of a concern for the overall market, economy, interest rates. When the market gets high by historical standards, I get nervous and prone to cash. By high, I mean the percentage of total market cap (TMC) relative to the US GNP, which is now 121%. We can see that, during the past four decades, the TMC/GNP ratio has varied within a very wide range. The lowest point was about 35% in the previous deep recession of 1982, while the highest point was 148% during the tech bubble in 2000. The market went from extremely undervalued in 1982 to extremely overvalued in 2000. And as Ray Dalio says, the relationship between interest rates and the market now indicates, at least to him, the most successful hedge fund manager in the country, that returns to US common stockholders are likely to be significantly below average for the next few years. So given my desire to be liquid after a 30-50% market decline, but not sell positions in companies with sales growth (I actually use gross profit growth) and financial condition so strong as to have the potential to go up in even a bear market, I’m mulling over different approaches to adding discipline to my selling. I’m finding the book 100 Baggers useful in that process because of its long term bias. You often make your biggest investment mistakes after big wins because you get sloppy-over confident and reach for investments (or trade in this case) outside your circle of competence. Notice the year on the Vanda chart (2009). This was one of those times for me. I’ve lost more money trying to trade than I’d like to admit. Boredom also causes an investor to reach and go down quality, craving activity. This is always a mistake. I agree with this “Boredom also causes an investor to reach and go down quality, craving activity. This is always a mistake” but what would you recommend for an individual who works but has little time for researching the whole gamut of microcaps out there? This is what is pushing me to compromise quality and go for short term gains. Raphael, thanks for your comment. I would say you don’t have to research the “whole gamut”. Find your circle of competence ( could be specific industries/fundamentals/etc) and know where the edge of the circle is.